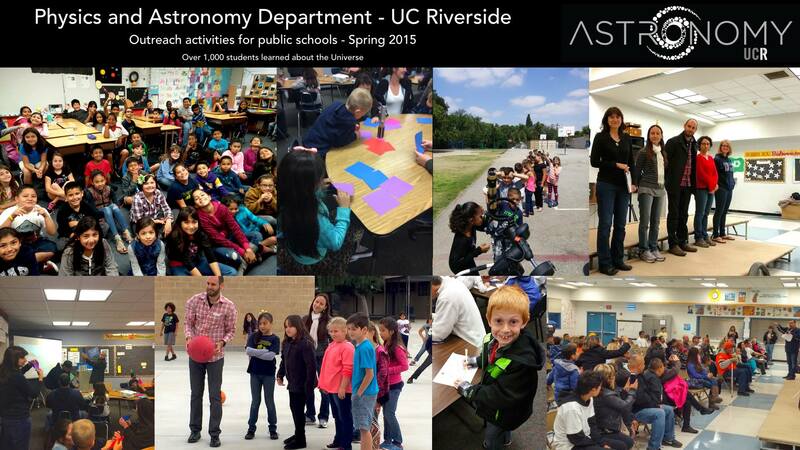 The Department of Physics and Astronomy at UCR announces a call for elementary, middle and high schools to request an astronomy workshop for Fall 2016. Workshops have been implemented for two years and over 5,000 students have enjoyed the wonders of the Universe, through talks, interactive activities and telescope viewings. The activities are offered free of charge and are given by postdoctoral scholars, graduate students and faculty members of UC Riverside. Workshops are designed following California’s New Generation Science Standards. Depending on the requested workshop and the number of students that will be taking it, UC Riverside may be able to partially or totally cover the cost of materials thanks to a National Science Foundation grant by Prof. Gillian Wilson and by the FIELDS Program lead by Prof. Bahram Mobasher. This year, the workshops have been revised for the Next Generation Science Standards and include more grades that can participate in them. Priority will be given to schools that request the same workshop be presented in two or three classrooms during the same day (60 – 120 students). Requests must be submitted at least 3 weeks in advance. Requesting period closes September 12th.